Interesting how even after hanging up a chef’s hat I still enjoy being called “chef”. Although I haven’t spent more than one occasional day at a time behind a professional kitchen range in some time, I am still filled with enthusiasm for kitchen life. One of my great joys when holding that position was orchestrating, or even just watching the hum of the line and the symmetry of a cadre of line cooks performing their magic. I continue to have tremendous respect for all of the characters with whom I worked and every serious line cook who sets his or her feet firmly on the rubber mats that connect the chefs table and “pass” from the scorching heat of flat tops, fryers, and char-broilers. These people are truly special. With this in mind, as a former chef looking back, I thought that I would compose a letter to those serious line cooks and provide some food for thought as they walk through the kitchen doors, put an edge on their knives, tie their aprons, hydrate in preparation for Sahara desert intense heat, fold their towels and organize stations, and mentally prepare for the rapid fire arrival of orders throughout service. First, let me state how much I admire your skills – skills that take time and dedication to acquire and focus to retain. These skills are physical, mental, emotional, and in many cases even spiritual in nature. These skills reflect the traditions of generations, the influence of numerous cultures, the formal and informal training imparted by seasoned veterans, the artistic touch of a painter or sculptor, and a pride that would be hard to find in other professions. Thank you for letting me remain a part of your passion for so many years. All this being said, there are challenges, disappointments, and self-imposed limitations that thwart your ability to carry these skills to the next level. So, under the heading of “for what it’s worth”, here are my observations, reflections, and recommendations for you. As much as the job of a line cook can be demanding, it is also invigorating. The pressure, the timing, the skill to coach the flavor from ingredients, the need to multi-task, the team communication and camaraderie, and the physical nature of the job do all come together in a flurry of intensity. When it works, it is incredibly gratifying and fun. Keep in mind that the ability to keep this pace up becomes more limited as you age, so the line cook’s job should be viewed as a pathway rather than an end game. The line cook’s job can become a rewarding pathway if you always strive to build on your skills, improve and expand your base of knowledge, and add new abilities to your box of career attributes. Seek to learn something new each day. Mediocrity is the kiss of death for a cook. You have standards, you have been trained well, you know what great food tastes like and how it should look, you take pride in every plate that you create – don’t ever forget that these are YOUR standards – never waiver from your standards. This is what separates the cook from the serious cook. Japanese refer to the process of constant improvement with the word: kaisen. The best cooks will look at their work as something that can always be improved. Be your own worst critic and others will be in awe of your passion for excellence. Serious line cooks hold their heads very high when asked what they do for a living. Few people understand what it takes to be a great cook and even fewer will ever take the leap and make the attempt to live the life of a cook. There are hundreds of years of pride behind the profession of cook – an important, necessary, and rewarding way of life. As much as the chef may guide you along the way of building great cooking skills, you may find that the people you work with can offer a depth of knowledge that goes beyond the pan and the grill. Learn about your coworker’s culture, their traditions, their history, and how their lives brought them to this point. Interest and respect for this background will carry you a long way with a career. There is great truth to the adage that you can be anything that you set you mind to becoming – especially in the kitchen. Commitment, passion, and consistent hard work can lead you to the role of chef, teacher, owner/operator, product development chef, manager, or even consultant in the future. Take a chance, take the leap, be adventurous, step out and push yourself – especially when you are young. “I can’t” really means “I won’t”. Travel, apprentice, volunteer, take a class, attend a conference, visit other restaurants, and take on that next position that you may not even be ready for. Your attitude of adventure will open many doors to your future. With the pace and demands of a line cook it is very easy to lose sight of how important your health is. Build some time into your schedule to exercise, eat right, visit a doctor now and then, balance your play with work and rest, and don’t get sucked into the excesses of life after a cook’s shift. Remember that you are setting the stage for the rest of your career and for how others will perceive you as a person. Treat your fellow employees, the chef and other managers, the vendors, and the customer with respect and it will come back to you tenfold in the future. Every thing that you touch, every product that you make, every opportunity that you have to interact with others provides a chance to sign your work. How you approach each of these becomes your real life resume. Take pride in each and every project, process, or interaction. If you need to julienne 20 pounds of carrots, then make sure that they are perfect. If you are charged with pre-marking steaks on the grill then make sure that those marks are defined and symmetrical, and if you are asked to jump in for 15 minutes and help the dishwasher get through a push, then do it as if each dish were signed by you. More than anything else, the chef or manager of an operation needs things done in the moment. Those cooks who understand this and willingly say, “Of course – you can depend on me” are the ones who will find plenty of great opportunities come their way in the future. When a guest asks for an exception to the menu – those cooks who know how important that guest is will respond “Yes” when it is physically possible to accommodate. There are legitimate times to say no. When you have not been trained to perform a certain task, when the request violates the standards of the restaurant, when yes might endanger others – then “no” is always the right response (along with an explanation why). Make sure your mise en place is always tight. When you are prepared then the results will almost always be positive. Remember, and live by Murphy’s Law – if something can go wrong it will – be prepared. Next to dependability, one of the cook’s greatest attributes will be how well his or her palate is developed. The appearance of food is very important, but it is taste that brings customers back time and again. Trust is essential, honesty is revered, and integrity is admired. Be consistent with your actions – if you promise it then follow through. Choose your words wisely – they are the single greatest indicator of how you feel towards others and how you intend to act towards them. Words bite deep and are difficult to erase. Cooks are noted for supporting others who wear the same uniform. Whether or not you have disagreements with a coworker – remember it is all for one and one for all. Support your team. What you (we) do is important. Cooking for the enjoyment and health of others is one of the most important things that you can do for them. Cooking has meaning and is one of the ultimate forms of communication. When you present a great plate of food you are saying: “I am good at what I do, I appreciate that you have come to enjoy my food, I feel that you are important and deserve the enjoyment of food and know that breaking bread can build friendships, break down barriers, and help to resolve the differences that plague a persons life. I know that if I handle myself well and invest in this process of growing as a cook – I can enjoy a rewarding career in some part of the food business for as long as I am able to work. 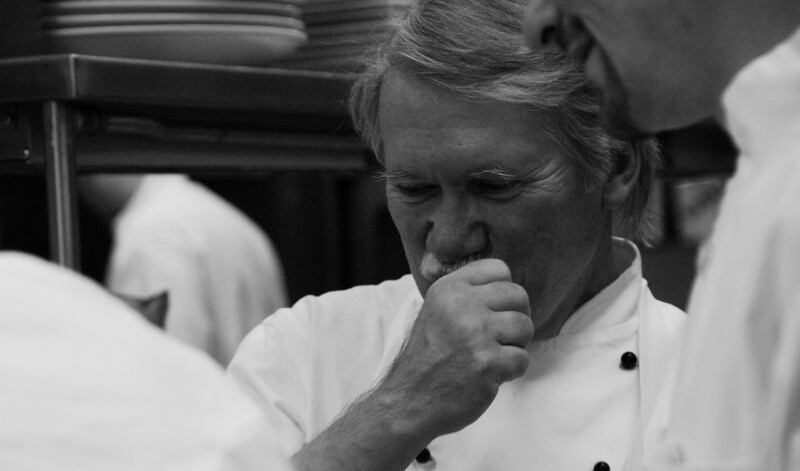 BE A GREAT COOK – BE PROUD – AND CONTINUE THE TRADITIONS OF EXCELLENCE THAT DEFINE WHAT IT MEANS TO BE A PROFESSIONAL. *Have you read Chef Paul Sorgule’s latest novel about life in the kitchen? If not – order your copy today from amazon.com. Click on the following link to place your order. So, you say a lifetime career in food. However, it’s also you say a Young Person’s game. So I’m wondering the average career lifespan of your chefs? If it is both, how is it possible? And are these your sincere opinions? Being a line cook is a young mans (or woman’s ) game. However , there is a life time of opportunity in food as chef, food and beverage director, restaurant manager or owner, teacher, writer, etc.